In accordance with Safety Team-1422(2017.08.09. )code, 2017 Ulchi Response Drill in UNIST is to be conducted from Aug 21 to 22. Ulchi-Freedom Guardian (UFG) is the name of the military exercise, a combined military exercise between South Korea and the United States. The exercise is the world’s largest computerized command and control implementation which mainly focuses on defending South Korea from a North Korean attack. The exercise was initiated in 1976 and is conducted annually during August. DDate Contents Preparer Concept Place Participants Etc. 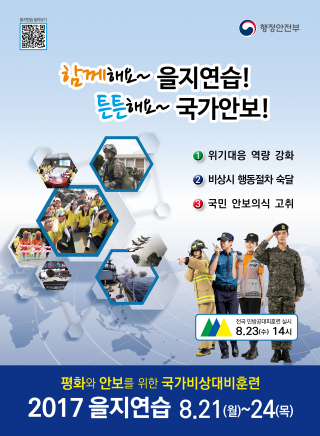 ** Security Education will be provided in Korean only. If you have any questions regarding this event, please contact me at patrickkimkr@unist.ac.kr.